Owing to the efforts of our dedicated team of professionals, we have been constantly engaged in offering the best quality Outdoor Wedding Stage. 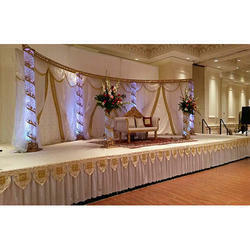 With enriched market experience, we have been able to offer a wide spectrum of Wedding Stage. We are remarkable enterprise, involved in offering superior quality Wedding Peacock Stage. Owing to huge knowledge and technical excellence, we are ranked amid the most admired firm of ultimate quality Decorative Wedding Stage. With an impressive growth record in this highly competitive industry, we are providing a qualitative range of Fiber Wedding Stage. We are one of the leading fabricators in Hyderabad. AP. Hydraulic warmala Stage For sale or Rental Service with uniq themes like Heart Shape, Moon, Sun, Temple, Lotus Etc. Simple Backdrop with small embroidery work. Customized sizes available with different colors and fabrics.